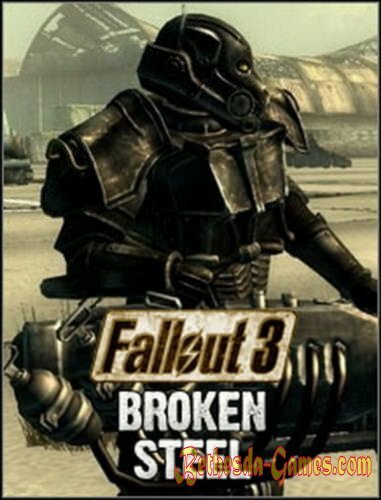 Broken Steel - the third expansion for the game Fallout 3. Update released on 5 May 2009. Supplement devoted to the completion of the conflict between the Enclave and Brotherhood of Steel Capital Wasteland. It is designed around an additional 8-9 hours of gameplay. Events unfold immediately after the completion of the original Fallout 3. After the destruction of the main base in the Capital Wasteland of the Enclave "Raven Rock" Brotherhood of Steel is ready to deal a decisive blow to the Enclave. The ultimate goal of the player is to penetrate to the base of the US Air Force "Adams" and the destruction of the last outpost of the Enclave - a mobile command center - with the help of a military satellite. But there is another option - the same satellite, you can destroy the Brotherhood of Steel Citadel.